One of the most iconic resorts in the Alps, Chamonix boasts incredible terrain across five main resorts, all within view of Mont Blanc, the highest peak in the Alps sitting at 4809m. And after you’ve hung up your skis for the day, you can enjoy the authentic French mountain village charm that Chamonix has to offer. Boasting over 119km of terrain to choose from across its five resorts. The five main ski resorts accessible by the Chamonix lift system are Les Grands Montets, Brevent/Flegere, Le Tour/Vallorcine, L’Aiguille du Midi/La Vallee Blanche, and Les Houches. And with a reliable bus service linking up all the resorts, you can explore a different area each day of your holiday. With all of this ski area, you’re guaranteed to find something to suit your fancy. Whether it be a family half term break or a corporate long weekend. From tree skiing in Les Houches to cruisy blues in Le Tour or even high octane lift access for those adrenaline seekers making off-piste skiing more accessible. And with Geneva airport only an hour down the road, Chamonix offers real convenience for people looking for a short break, or families keen to cut down on travel time. The best way to see a resort is through the eyes of a local. So if you want to make the most of your stay in Chamonix check out our Chamonix Ski School. The best ski runs in Chamonix – our pick of the bunch. With the vast amount of terrain available to ski in the Chamonix Valley, you’re guaranteed to never ski the same run twice on a week’s trip. The Chamonix Valley is focused on intermediate to advanced level skiers but this does not mean you will be in short supply of those gentle runs to get your legs back. Chamonix boasts a peak height of 3842m allowing for season-round skiing. As a fully functioning town, Chamonix has even been known to be busier in the summer months! Palancerts – Cruise blue meets rolling wide red run through the trees, this piste is situated on the back side of Les Houches ski area facing into the Ce Lange valley. With views of Saint Gervais, this piste is ideal to hone your skills whilst challenging you amongst spectacular scenes. Lognan, Les Grand Montet – More than your average black run. The piste begins on glaciated terrain allowing short detours off-piste. With a decent of 2000 vertical meters, this is a must do in Les Grand Montet. Micro Brasserie Chamonix (MBC) – A Canadian-run microbrewery known for its meaty burgers and chicken wings. An easy option for craft beer lovers and hearty food. Situated near the ice rink of Rue de la Bouchet. Les Vieilles Luges – Located off the beaten track of the Maisonneuve chairlift in Les Houches. Serving traditional cuisine from within an 18th-century barn offering a true Savoyard experience. Plan Joran – Situated in Argentiere, near the Tab chairlift. Boasting a fantastic Savoyard menu with iconic views across the Chamonix Valley. The Chamonix Social Club provides post ski cocktails as well as post apres beers, something for everyone in an ambient setting. Elevation 1904 is the best place to be after a long day skiing. Live music, beers, food and cocktails and an easy move from après. In 1741 two Englishmen, Windham and Pococke, discovered the ‘Chamouny’ valley and its glaciers. Their expedition was met by a rural population of mountain farmers, and a humble monastery. This community lived off animal husbandry and a sparse harvest of oats and rye. The two Englishmen explored the valley whilst publishing their literacy journal throughout Europe, starting a new craze about Chamonix! In 1770 Chamonix’s focus was growing, its first guest house was opened by Madame Coutterand. It also encountered various celebrity visits in 1783 such as Saussure, Goethe and Bourrit, had visited the valley and raised its profile. Around 1,500 visitors ventured to Chamonix each summer. Two local men Paccard and Balmat, made the first-ever ascent of Mont Blanc in 1786 and shortly after Chamonix’s first luxury hotel was built in 1816 (The Hotel de l’Union), followed by ‘la Couronne’, ‘le Royal’ and many more. In 1924 Chamonix hosted the first Winter Olympic Games. Skiing was introduced in Chamonix at the end of the 19th century by Dr Payot. The first big winter season was in 1906-07. Much of the initiative came from the ‘Club Alpine Français’ which organised a local winter sports competition. There are buses from the airport but you will need likely need to change, and it’s advised to book one in advance. The train is the cheapest option from the airport but this will involve several changes and will be a longer journey than 1hr. It’s about an 8hr drive once in France to reach Chamonix. The benefits of driving are no luggage restrictions and the option of an extra day skiing during a week’s holiday but the tolls can be quite pricey on the motorways so something to consider. How easy is is to get around Chamonix? There is a regular free bus service in Chamonix which links all the villages. You can find the bus timetables here. Ski rental specialist situated at the entrance in Chamonix Village. They offer a large range of high-end quality ski rental, boot fitting services, as well as ski touring and climbing equipment for hire. These can be accessed on the Chamonix website. Where can I find more information about Chamonix? A helpful site with regular event listings of what’s going on in resort, snow reports and more. Chamonix boasts a range of shopping experiences. This may be high-end designer clothing to quality sports shops. There are many supermarkets, bakeries and local markets spread around the resort. What services are available in Chamonix? Chamonix includes a wide range of services you may need on your visit. These include Doctor, Pharmacy, Post office, Hairdresser, Tabac, Tourist office, hospital. 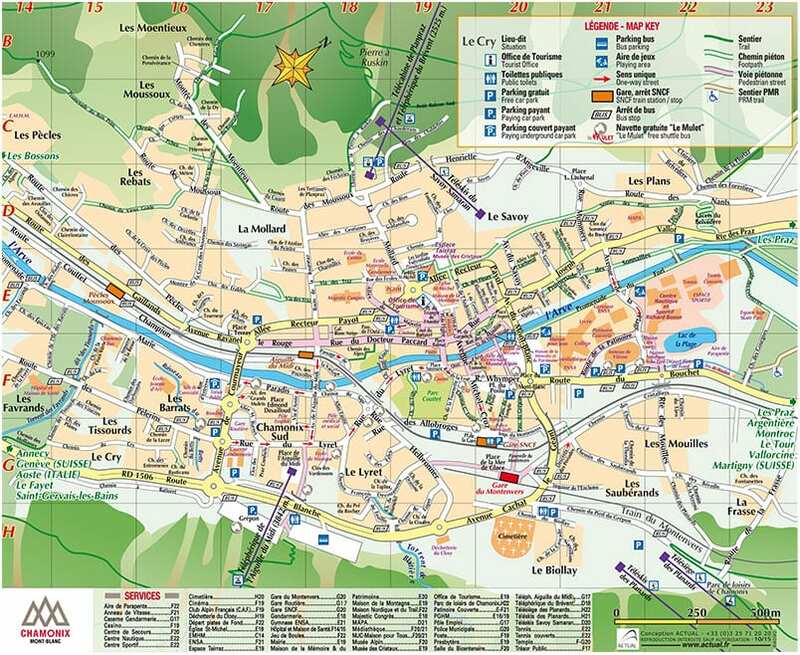 Chamonix is a fully functioning town, therefore, it will not be difficult to find the service you may require. What non-skiing activities are there in Chamonix? For those non-skiers, there is plenty to do in Chamonix. Taking a trip up the Aiguille Midi is just as exciting for non-skiers and provides a spectacular view across the valley and into Italy. There is a variety of activities in the town from bowling to luging or even a trip to the cinema. A must is taking the tramway to Mont Blanc which winds its way through forests whilst providing stunning views of the work renowned Mont Blanc, reaching the Bellevue area of Les Houses. Stop off for lunch and return to the town by train. A trusted service providing high-quality nanny services within the Chamonix Valley.